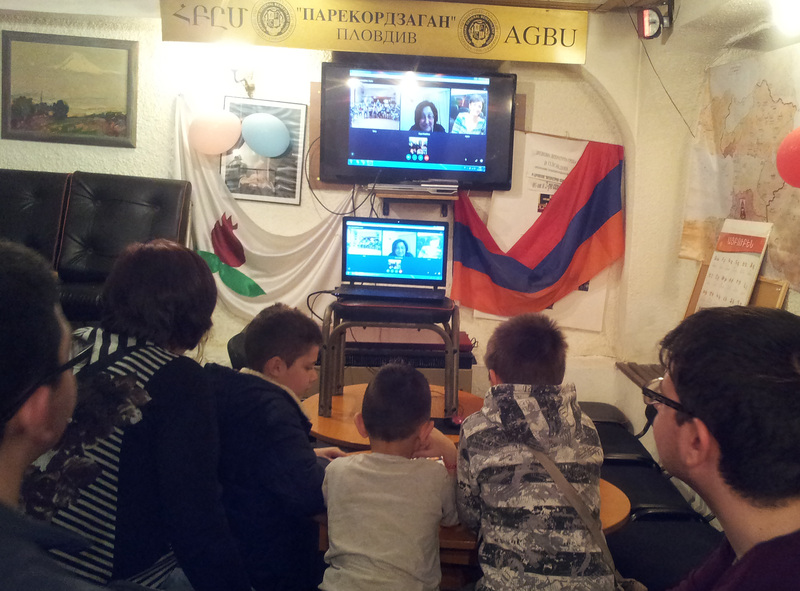 From November 2015 the children who study Armenian language to Saturday school of “AGBU” Plovdiv Chapter launched a new curriculum – Armenian Virtual College (AVC). It is designed in a fun and interactive way to prepare children spoken and written to master their mother language. The new concept of the administrators of the program in Armenia – Arpine Tavakalyan and Zepyur Kebikyan is to make classes of AVC in live dialogue exercises. On February 4, 2016 was made first contact through Skype, which was dedicated to the celebration Vartanants. The second meeting was with the children of Plovdiv and the children of the Armenian Saturday school in Montreal, Canada – “Hayortats Ohr” on March 5, 2016. First presented students from Canada. They talked about the different activities that take place there – from classes in Armenian language and dance classes to chess (AVC). Then they presented each, asked each other questions in Armenia, recited poems, and children from Plovdiv played part of the play by their teacher Arch. Alvard Badvaganyan, “The Wolf and the Seven Little Goats”. Common interests and goals which have AVC gave birth to a new idea proposed by Arpine, to create a Facebook page through which children from Montreal and Plovdiv to share and get closer.